Question to Building Inspector: We are looking at moving to rural Livingston Parish, Lousiana and planning on building our own earthbag home within the next year… Any help in this regard would be greatly appreciated. Building Inspector: I have viewed the website for earthbag building that you mentioned and it is very interesting, however, the entire State is under the Uniform State Building Code and I cannot find anything under the prescriptive provisions of the International Residential Code that would allow this type of construction. You may find an architect/ engineer that would design, engineer, inspect, and sign off on it for occupancy, as an alternate to the building code. You would have to go thru all the permit process as regular construction, which includes plan submittal before construction could begin. If you need further assistance please feel free to contact me. Comment from PSE Engineering, Inc.: We can help you with the structural engineering design for your sustainable/green earthbag home. Regarding the inspection, a local certified inspector can do it for you. He/she can submit the inspection report to me and I check it and if correct, I will approve it. The average cost engineering the drawings is about $2,500 based on the area and how complex is the layout. Please note this is an estimate only and it depends on the area and complexity of the building. I look forward to receiving the layout and serving you on this green home. Thank you so much for your business. Hi , my name is Roy , I am 58 and just bought a small piece of land in Colorado and want to build a home to retire in and not be forced to build something the inspectors at the county want you to build . why do they care how I live ,I should be able to build any thing I want as long as I do not plan on selling it upon completion . I want to use materials that I found at habitat for humanity and used fixtures gathered from other places to keep costs down . I had this idea that we should all get together and get a lawyer to start a class action lawsuit against the authorities for discrimination against the poor and change the system designed to serve the wealthy. If only like minded people could unite, is there any lawyers out there that want to make a name for themselves and do this . this is probubly why there s so much homeless people roaming the streets. housing shouldn’t cost hundreds of thousands just hundreds. If I wanted to glue pinecones together to make a house I could or cement rocks together it shouldn’t matter. Most people before sinking a sizable sum of money into an alternative building method, would want to see a completed structure up close. By that I mean, if they were wanting to build a rectangular earthbag home, they would want to see a rectangular earthbag house up close. a bee hive dome would not cut it. I think so. But it may be difficult finding a finished home to look at. Most people don’t publicize their projects and most don’t want strangers showing up on their doorstep (especially when the initial thrill of completion is over). People are better off volunteering for a weekend or so. That way they can see firsthand how things are built and ask lots of questions. It’s a win-win situation for everybody. There are numerous large natural building workshop sites. Anyone have any thoughts on neighbors and building to code? I’m planning to build on my land in rural NW New Mexico at some point, but my concerns are either not building to code and being fined (or worse!) vs building to code and the possibility of being THAT person who invited the building inspector and ended up having one of my possibly non-code neighbors fined (or worse!). That would be horrible. I suppose I could start with some type of temporary or starter stucture until I get to know the neighborhood better… Thoughts anyone? PSE’s fee is reasonable since a lot of work can go into a set of plans. Clients often want just a few more changes. Yet I understand it is daunting to many who’d like to build. For a start in a new un-earthbagged area, would it be realistic to build an accessory structure? In my area I can build 2 stories of 120 sf each without it needing to be a ‘regular’ type of plan. If there is any way to start the home with this, hoping to introduce the building inspector to earthbag’s strength. Then be ready to have a larger addition that turns it into a normal size home… Get into the structure first (only if one is not a large family!) and then be able to pay for the engineering to add on. Owen, I would love to see a larger 50- 100 thousand dollar cost earthbag home. I just don’t believe earthbag building has reached the mainstream enough that, people with large amounts of resources want to use it. And if they had those kind of resources, I believe most would likely have it built rather then be a DIY person. Most people before sinking a sizable sum of money into an alternative building method, would want to see a completed structure up close. By that I mean, if they were wanting to build a rectangular earthbag home, they would want to see a rectangular earthbag house up close. a bee hive dome would not cut it. They would also want to know if their dream project was insurable. Regardless of the data from Cal Earth, most insurance companies are more then hesitant to insure alternative building methods. While the engineering fee of $2500 is certainly reasonable and it is good to have PSE on board, I believe most earthbag builders building today are doing so because of the low cost. Engineering fees add substantially to a very limited building budget. A lot of people dream of building a large custom earthbag home in a permit required area ( I know I did), but the extra hassle of dealing with building departments, time lags, permit fees, associated system building and of course the engineering fees will squash all but the most fervent of earthbag devotees. Most will decide to relocate to a more favorable building environment such as New Mexico or even move out of the country. 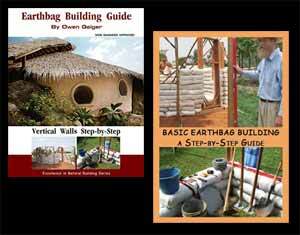 As time progresses I hope we see earthbag building become common and mainstream. I hope we do see some large custom built earthbag estates in high seismic risk areas like California. I just don’t see the majority of people who are actually building and using this site as a guide requiring or having the resources to use an engineering firm. That’s true, but there are a fair number of people buying large plans from me. From what we have learned – initially, counties were created for the sole purpose to “record.” Lately (last few decades), they have been engaged in commerce game soliciting fees and fines. Their budgets have been overblown and with a current downturn of the “housing” and builders not being able to obtain commercial loans from banks, they are struggling to maintain these bloated budgets. Instead of going back to basics, they are trying to figure out how to squeeze more to sustain their “business” model. A good example of “commercially-driven” counties are King, Pierce, Skagit, Snohomish counties in Washington. It’s impossible to get anything approved unless it is a standard (cookie-cutter box) type of construction or, otherwise, large $ sums are invested in the “fight.” There are way too many examples of such stories present in these counties – from tree houses to cob and strawbale. But old trailers and mobile homes galore throughout named counties. The frustration with this commercialized approach is evident. “One hand is warming the other.” “Licensed-only” Engineers signs off on plans, county “allows” the construction. But if the structure does collapse – neither county nor engineer is responsible. No liability. So, what are the “applicants” (“beggars” by Black’s Law Dictionary definition) paying for such as these fees in thousands of $? So, what is the point of all these $ invested, time wasted? The solution might seem plausible to most with small budgets to construct something temporary in nature. Such as “Emergency Shelter” vs. “Home” or a “Cabin.” The last two are commercial definitions – check into Black’s Law Dictionary. The “Emergency Shelter” is that – temporary in it’s nature. No permanency. No permit needed for a yurt unless it requires a permanent foundation. No permit should be required for ANY emergency shelter structure especially when it is molded from Earth as an Igloo with no permanent foundation and/or 120v line fed in, septic system, water pipes. How does one chose not to utilize such amenities? That’s where practicality and good “on a budget” solid ideas are present. Avoid the concrete foundations or slabs. 12v lightening only. Composting toilets? Portable water systems such as in RVs with 12v pumps? For those seeking a “house” – it is a definite uphill battle with any county. And lots of $ (needless to remind that Banks will struggle to finance such “dwelling” unless lots of cash is present for the downpayment). From our experience – our engineer-stamped plans were “lost” at the county. Needless to say that the county struggles to reimburse us $2.6k for the plans and its representatives have no desire to classify our “structure” as a “house,” but as an “emergency shelter” only. At least that is the outcome from our experience. No property “development” is present, but a shelter and lots of permaculture and forest gardening improvements. They simply left us along. Everyone of them has a strict budget. An engineering fee would add over a third of the total cost of the structures they want to build. Too bad no one has some ready drawn plans that are engineered/permit ready for at least the western US. I know Cal-Earth used to offer California plans, but it now looks as if only the small dome is available. The larger vaulted house is only for study and they never did offer a rectangular more conventional shaped house. Of course their plans would probably require the use of tubing. Actually a large number of readers want to build larger homes that meet code. I know this because they send me hundreds of emails asking for more details. So if you’re willing to spend $50,000 to $100,000 or more then the engineering fee is miniscule. I think it’s a very reasonable fee considering the difficulty involved. And Precision Structural Engineering is the only company offering this service at this time. Precision Structural Engineering will engineer custom earthbag designs. And for those who are on a tight budget and can’t afford engineering, we go to great lengths to show dirt cheap housing techniques. One question that keeps coming to mind for me is whether or not they have pre-approved plans at a lower price. Codes vary drastically from one place to the next. I’m not aware of a “one size fits all” plan. Even Cal-earth’s domes need a local engineer to sign off on it. Well at least this building inspector is cooperative and says that it is possible as long as an engineer signs off on it. Hopefully the county inspectors are like this in Colorado as well. My friend and I are planning on building a few earth bag homes in the Denver area and we could split the cost of the engineer plans in half if we can both agree on the same model design (build 2 homes from one set of plans). The previous head of the building department in Pueblo used to educate building authorities across the country about strawbale building. Any building official could call and he would answer their questions. He even brought in top strawbale experts to speak at conferences and ‘greenlighted’ our project. So you never know, some are very good people. But… I’ve heard Denver is among the worst for approving alternative building. Maybe the engineer can get it approved.